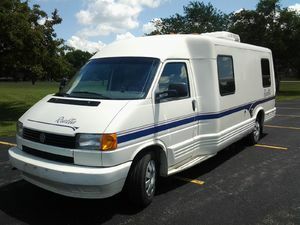 Good running class B motor home with fuel efficient 2.5L VW engine that runs smooth and quiet. This is an ingenious multi-purpose motor home that performs like a luxury car and lets you go places that you would never expect to go in a motor home. Lots of elbow room with the dinette, an efficient kitchen, and a creative pull-out bathroom, complete with shower option. With a maximum 6'2" of headroom, most folks can move about the Rialta with ease. Has 4 very comfortable forward-facing captain's chairs and for living convenience, it has a standard self-contained water supply in addition to the microwave and roof air conditioning. It is also equipped with a 6-speaker deluxe sound system. REDUCED PRICE TO SELL FAST! !